FITTING / BONDING EPOXY TDS FE-180A 1:1 Fitting Epoxy has been formulated to achieve outstanding bond strength to most common marine materials including teak, other woods, fiberglass, aluminum and steel. The specially- engineered fillers allow the TDS FE-180A to display superior wet-out of the bonding surfaces resulting in both a mechanical and chemical bond to adhere to even the most challenging substrates. Once cured, the TDS FE-180A Fitting Epoxy provides excellent water- resistance, flexibility and internal strength which ensures the long-term stability of the composite structure. TDS FE-180A Fitting Epoxy will cure in temperatures simplified 1:1 mix ratio allows a batch of any size to be easily measured and mixed. Once thoroughly mixed, the material can be spread immediately, requiring no induction time. For further info see properties chart at the end of this document for cure specifications. 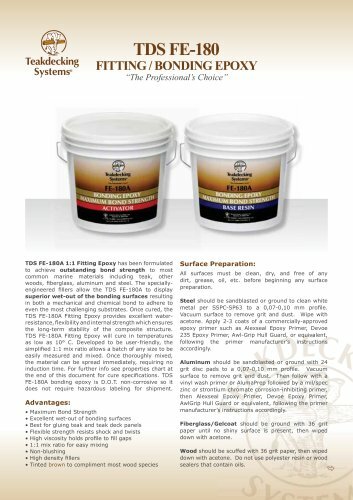 TDS FE-180A bonding epoxy is D.O.T. non-corrosive so it does not require hazardous labeling for shipment. • Maximum Bond Strength • Excellent wet-out of bonding surfaces • Best for gluing teak and teak deck panels • Flexible strength resists shock and twists • High viscosity holds profile to fill gaps • 1:1 mix ratio for easy mixing • High density fillers • Tinted brown to compliment most wood species Surface Preparation: All surfaces must be clean, dry, and free of any dirt, grease, oil, etc. before beginning any surface Steel should be sandblasted or ground to clean white Vacuum surface to remove grit and dust. Wipe with acetone. Apply 2-3 coats of a commercially-approved epoxy primer such as Alexseal Epoxy Primer, Devoe 235 Epoxy Primer, Awl-Grip Hull Guard, or equivalent, following the primer manufacturer's instructions Aluminum should be sandblasted or ground with 24 grit disc pads to a 0,07-0,10 mm profile. Vacuum surface to remove grit and dust. Then follow with a vinyl wash primer or AlumaPrep followed by a mil/spec zinc or strontium chromate corrosion-inhibiting primer, then Alexseal Epoxy Primer, Devoe Epoxy Primer, AwlGrip Hull Guard or equivalent, following the primer manufacturer's instructions accordingly. Fiberglass/Gelcoat should be ground with 36 grit paper until no shiny surface is present, then wiped down with acetone. Wood should be scuffed with 36 grit paper, then wiped down with acetone. Do not use polyester resin or wood sealers that contain oils.